The new Aberdeen bypass will not cut through land used by a community for people with special needs. 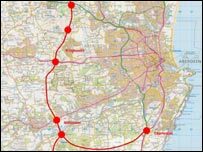 The transport minister has unveiled the route, which could cost up to £395m. Tavish Scott rejected the five original options in favour of a compromise route through Milltimber Brae, with a new fast link via Netherley to Stonehaven. Campaigners welcomed the news that the Camphill community's Newton Dee site would be spared - but the decision stunned those in the Milltimber suburb. Residents expressed shock and said they would be organising a protest meeting about the plans. However, Camphill's leader, Dr Stefan Geider, said he was delighted that ministers had listened to sense. "I think everyone out here has heaved a huge sigh of relief," he said. "Having said that, it is not a time to celebrate because we are well aware that other people are going to be affected by this. "We are now looking forward to life returning to normal." Mr Scott said the bypass would be an integral part of the north east's transport network. "This bypass is more than a road. As well as cutting congestion and reducing pollution, it will provide a significant boost to the local economy and bring welcome benefits to businesses in the area. "It was therefore extremely important that very careful consideration was given to the planned route." The cost of the road has been estimated at between £295m and £395m, with completion by 2011. The Scottish Executive said it thought the final price tag would be at the lower end of the cost estimates. The cheaper Murtle option, which would have split the two Camphill communities for adults and children with special needs, was Aberdeen and Aberdeenshire councils' preferred route. However, ministers rejected the proposal in favour of one combining the Milltimber Brae section with a new fast link from the north of Stonehaven to take traffic away from the congested A90. Ian Yuill, deputy leader of Aberdeen Council, said: "We appreciate this has been a very difficult decision for the minister to make with some difficult choices, but the important thing is that this uncertainty is now over and the people living on the routes that have not been chosen can get on with their lives." Aberdeenshire Council leader Audrey Findley said: "We have waited some time to hear this and I think this route meets all the requirements for the traffic management and the whole transport system for the north east of Scotland." However, Friends of the Earth Scotland dubbed the process a "sham". Chief executive Duncan McLaren said: "There was no examination of alternatives and the so-called consultation failed to offer a single option that does not include new road-building. "The executive has simply bulldozed over due process. To now add in a second brand new road means even greater environmental damage. "The plan must now be subjected to full public inquiry and environmental impact assessment, including genuine assessment of the need for the road, in the face of alternatives that do not involve new road building." 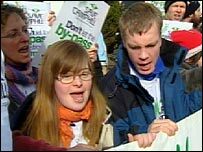 The Scottish Greens also urged ministers to scrap the bypass altogether, warning that more roads generated more traffic. Shiona Baird, Green North East MSP, said: "The bypass will only reduce congestion in Aberdeen by up to 2.5% - this hardly justifies spending nearly £400m. "Congestion costs the UK economy £20bn per year. The executive's attachment to building roads is stifling economic progress. "More regular and accessible bus services, a renewed commitment to the seemingly abandoned cross-rail project and the re-opening of 'commuter' stations into Aberdeen would all help cut car use."